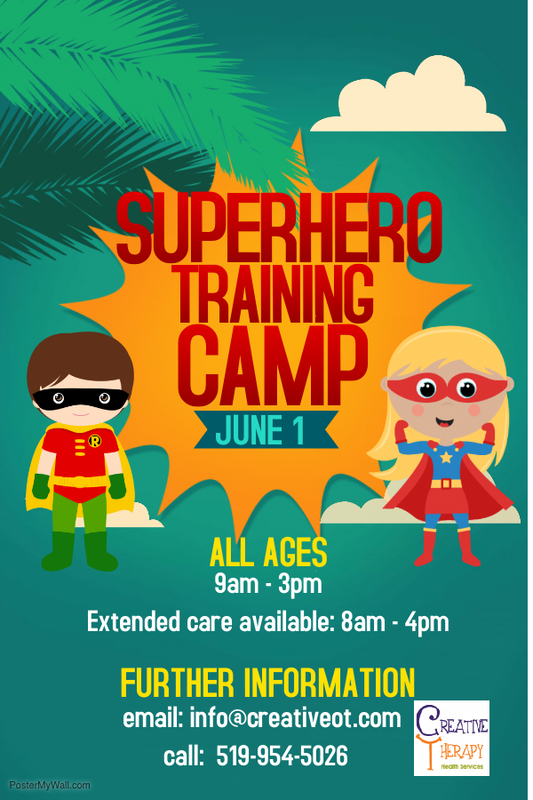 The June 1 2018 PD Day Camp is themed around Superhero Training. After Hours Care: If your child requires additional before or after hours care please contact us prior to the camp to discuss your needs so that special arrangements can be made. Creative therapy offers PD day camps that coincide with the Waterloo Regional District School Board and Waterloo Catholic School Board calendars. Each of the camps is based on a fun theme, like “Superheros”, “Outer Space” or “Going to the Beach”. These camps provide a fun and safe experience designed and led by an Occupational Therapist. Children work on a variety of fine and gross motor skills while developing appropriate social skills. A high ratio of counselors to participants ensures that your child receives the attention necessary to ensure they have a fantastic experience. Camps are structured around “Activity Stations”, where groups of children transition from one activity to another. The activities will help the children develop confidence in sequencing, planning, fine motor and other requisite skills while having fun and socializing.